The left arm should be straight at the top of the backswing. One common phrase heard around driving ranges and golf courses is "keep your left arm straight." This advice can help right-handed golfers create power in their swings. Most golfers, however, don't know the fundamentals that allow you to keep your left arm straight in a golf swing. Keeping your left arm straight during the swing requires the proper grip, arm swing, downswing path and body turn. Learn these fundamentals and you will consistently be able to create a powerful swing. Grip the club in the fingers of your left hand (for right-handed golfers). You should see two or three knuckles of your left hand grip. The "v" formed by your left thumb and index finger should point toward your right shoulder. Grip the club in the fingers of your right hand with the right pinky finger overlapping the index and middle finger of the left hand. This grip will give you leverage to hinge your wrists while keeping your left arm straight. Swing the club back with your shoulders and begin hinging your wrists. Keep your left arm extended as you turn your shoulders and hinge your wrists. Stop your backswing when your left shoulder is under your chin and your arms are slightly higher than your shoulders. You should feel like you are pushing your hands away from your chest to keep your left arm extended. Start your downswing by moving your lower body to the target. This will help you bring the club down along a proper inside-out path. Turn your hips toward the target and keep your left arm extended as you continue swinging down to impact. Turn your hips through the impact position and hold onto your wrist hinge until just before the moment of impact. Keep turning your hips as you swing through impact and strike the ball. Let the club rotate over as your arms extend out to the target. 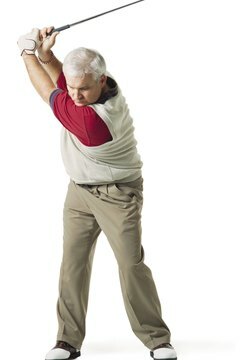 Halfway through the follow-through the left arm should finally bend as you fold both arms to a finish position. Your shoulders and hips should face the target at your finish.